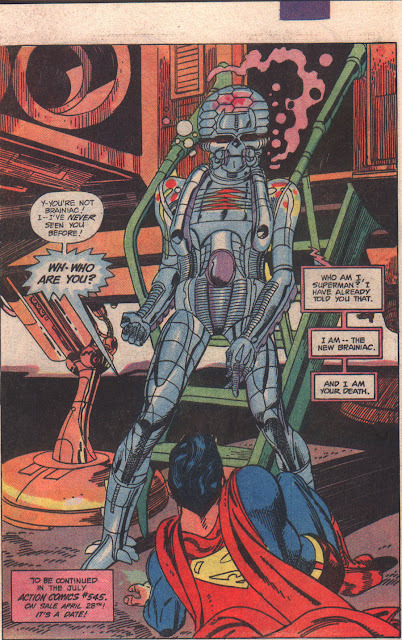 Man of Steel won't even be released until 2013, but I've already devised a sequel pitch: call it Men of Steel and have Superman fight Metallo, Brainiac (pictured above) and an army of retro 1930s-style giant robots, as suggested in yesterday's post. It's simple: giant robots invade city, Superman defeats them, clues lead to Metallo and Lex Luthor (man of steel will), but behind the scenes is alien invader Brainiac, who's been manipulating Metallo and Luthor and softening up the world for his final assault. In the end Superman's brawn is insufficient to defeat Brainiac, and he has to draw upon his wit and even his compassion. He convinces Luthor and Metallo to join forces against the greater threat. When the dust clears, Lois Lane ruminates: "Sometimes you don't need to be a man of steel," she says, referring not just to Superman but Metallo and Luthor, "Sometimes it's enough just to be a man." Roll credits!